The question of what to call Prince Charles's wife, Camilla Parker Bowles, has been one of the biggest headlines of the modern royal family. Although she technically became the Princess of Wales when she married Charles, she chooses to use the title of Duchess of Cornwall instead, since the "Princess of Wales" title was so strongly associated with his first wife, Diana. There's also likely to be controversy over her title once Charles becomes king: she'll be queen consort in the eyes of the law, but may or may not use the title officially. But there's a more important question at hand: what do her step-grandchildren - Princes George and Louis, Princess Charlotte, and the future Baby Sussex - call her? 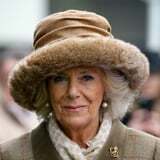 While we've never been told officially what Charles's grandchildren call Camilla, she did reveal what her grandchildren from her biological kids call her. Shortly after Prince Louis's birth, Camilla told the Daily Mail that her grandkids call her "GaGa." So, it's possible that Prince Charles's grandkids call her the same. "I don't know if it's because they think I am," she joked, "but it is still very sweet." The one thing that the step-grandkids definitely don't call her? "Grandma" or "Granny." That's reserved, apparently, for their biological grandmothers. In the ITV documentary Diana, Our Mother: Her Life and Legacy, Prince William explained that he makes sure to tell his kids about Diana. "I think, constantly talking about granny Diana, so we've got more photos up round the house now of her and we talk about her a bit and stuff," he said. Regardless of what the royal children call Camilla, we do know that they apparently adore each other - and that's what matters most in the end!